Your fans are Scarlett Johansson, Lea Michele, Olivia Palermo, Cate Blanchett, Sonam Kapoor, Beyoncé and Michelle Obama. You have 10 UK stockists and a further 57 internationally. Accompanying a main line there is a collaboration with retailer Debenhams, a diffusion line, children’s clothing, shoes and eyewear. That all equates to Preen by Thornton Bregazzi. Founded in 1996, Justin Thornton and Thea Bregazzi have developed their label astronomically. Almost 20-years after launching their brand, the duo are the one of the most sought after brands as their celebrity fans and 67 worldwide stockists illustrate. An unused, winding entrance tunnel to King’s Cross Station played host to the show. Before the show began, the walls lit up in a rainbow (an obnoxious amount of photos were taken). Molly Bair opened the show in a multicoloured, lumberjack-check sheer dress. Autumnal hues adorned the body of her dress, but a pop of bright blue here and there provided a beautiful touch. Look 3 featured an aviator jacket with teal, check sleeves and red check panels, black shearling, bright blue lapels and a taupe wool. Look 8 was a checkered, floral appliquéd skirt with yellow cross-stitching. Annely Bouma’s sheer white top with crystal embellishments and floral appliqués was delicate, and simply breathtaking. Her black trousers featured a whtie cross-stitch hemline. This collection, I believe, would benefit from a re-see. The proof is in the details of this collection. Embellishments and embroideries were intricate. Also, some tonal looks may get lost in the sea of gorgeous maximalism. Saving the best for last, Alexandra Elizabeth emerged in multiple shades of blue. The appliqués on her dress were 3-D florals. 1970’s boho-luxe was perfected by the duo. Instead of going for the predictable avenue, Thornton and Bregazzi opted to put their spin on the decade. Crop tops instead of floaty blouses. Asymmetric hemlines instead of flared ones. The trousers were more masculine than feminine. 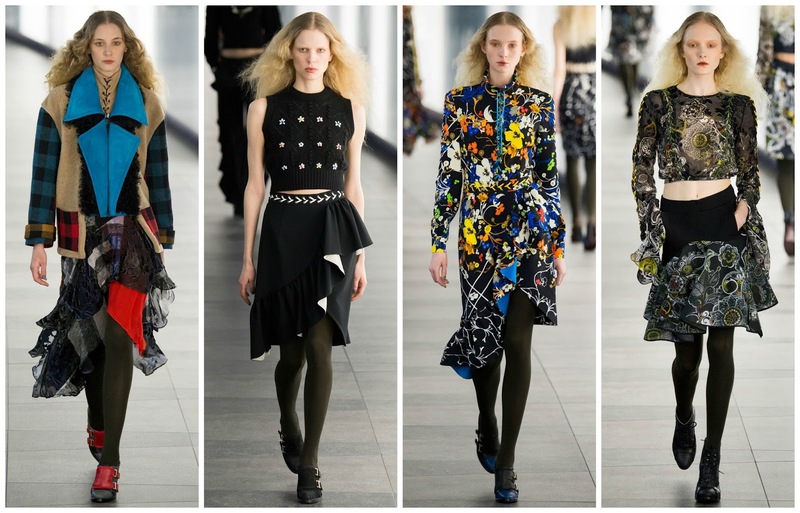 An intense amount of prints at the show reworked 60’s/70’s flower-power. All these re-imaginings of the past sprouts the idea of modernity that I spoke of in my Gucci review. Modernity comes from the past. Justin Thornton and Thea Bregazzi’s take on the 70’s has given us modernity and new ideas. That’s a feat in my book.